10. Lady Sarah Chatto wearing Princess Margaret's jewels. 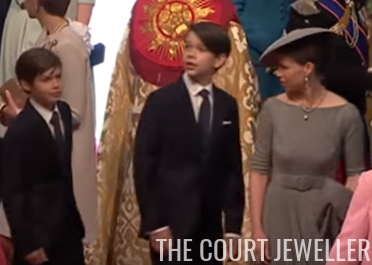 It's a little difficult to see in the fuzzy screencap above, but Lady Sarah wore a pair of earrings, a brooch, and a necklace inherited from her mother, the late Princess Margaret. The diamond and pearl earrings were also worn by Sarah on her own wedding day; the necklace (which originally belonged to Queen Mary) is made up of alternating diamonds and pearls, and is worn here with a pearl pendant. 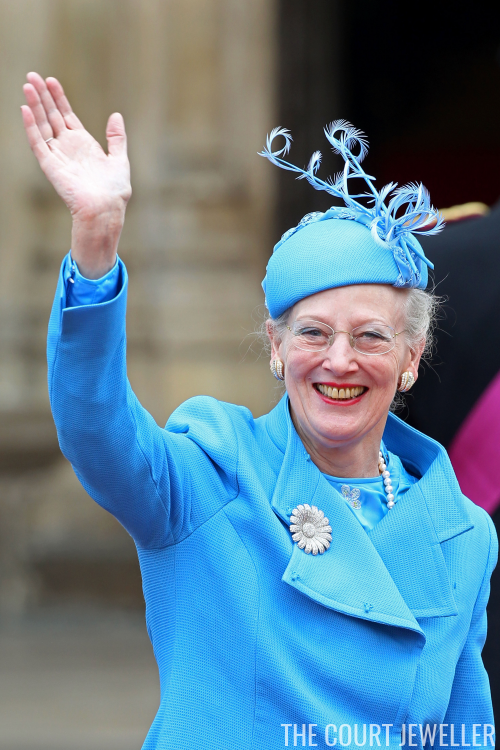 The brooch -- Princess Margaret's wheat-ear brooch -- was pinned to her hat. 9. 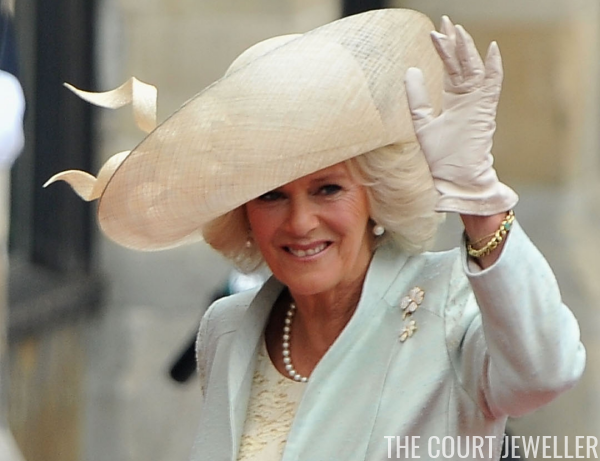 The Duchess of Cornwall wearing pearls and a lucky pair of brooches. Camilla went with a single strand of pearls, rather than one of her usual multi-stranded choker necklaces, but she added a bit of sparkle with her pair of diamond clover brooches. Perhaps a bejeweled gesture to wish good luck to the bride and groom? 8. The bride's symbolic earrings. Made by Robinson Pelham just for this wedding, Kate's diamond earrings symbolized the marriage of her old life with her new one: they wed together a diamond scroll that matched the design motif of her borrowed royal tiara with an acorn, one of the images found on her father's coat of arms. The earrings were also "something new," a wedding gift from her parents. 6. Queen Maxima wearing (part of) her wedding tiara. This may have been a daytime wedding, unlike the Scandinavian royal wedding tiara extravaganzas, but that didn't stop Princess (now Queen) Maxima of the Netherlands from smuggling in part of her own wedding tiara. She just affixed the diamond stars to her hat instead! 5. Princess Lalla Salma, bejeweled from her head to her waist. The wife of Morocco's king carries off "ornate" better than almost anybody else, and her golden and bejeweled suite of jewels at this wedding was no exception. Note that her golden belt perfectly coordinates with her glittering earrings and necklace. 4. Queen Mathilde shows off one of her own wedding gifts. The classic Brabant Laurel Wreath can be worn as a tiara or, as Princess (now Queen) Mathilde did here, as an elaborate necklace. She also accessorized with diamond and pearl earrings, a diamond floral bracelet, and the diamond rose brooch made by Wolfers. 3. 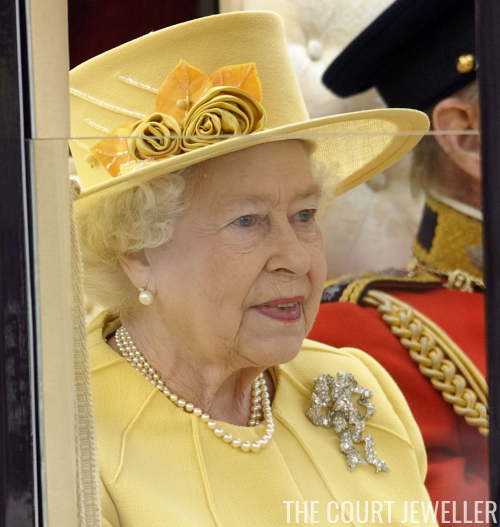 Queen Elizabeth II wears one of Queen Mary's grandest brooches. The elaborate nineteenth-century Lover's Knot Brooch was purchased by Queen Mary from Garrard in 1932. Since inheriting it in 1953, the Queen has worn the large piece for two royal weddings: Princess Margaret's wedding in 1960, and this wedding. 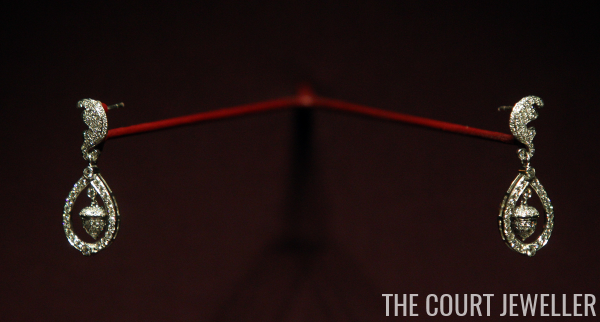 It's one of the largest and most glittering brooches in the Queen's enormous brooch collection. 2. A true royal wedding treasure: the Danish diamond daisy. Made of diamonds that once belonged to a British princess, Margaret of Connaught, this daisy brooch was worn by both Queen Ingrid and Queen Margrethe at their weddings. 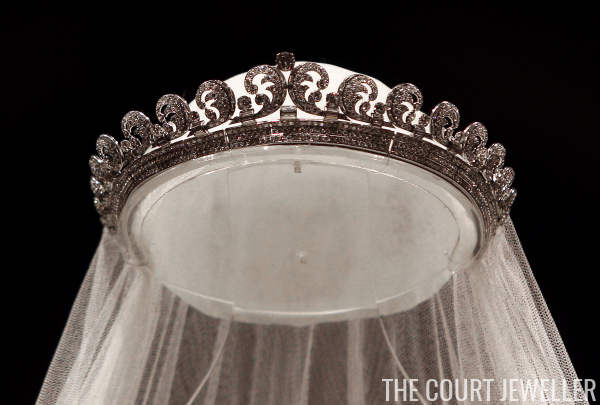 1, The wedding tiara. Really, it would be rude to offer the top spot to any other piece of jewelry. But this diamond and platinum Cartier tiara deserves it: worn by three generations of the royal family, it links Kate not only to the present queen (its owner) but also to the Queen Mother, who has been something of a role model for Kate in her new royal position. 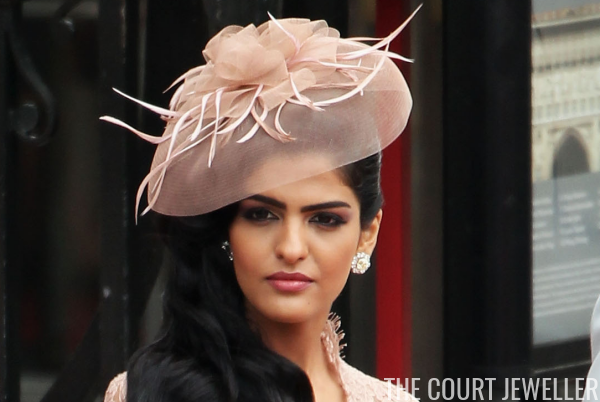 Glittering and modern, but somehow understated, it was a perfect "starter" tiara for a new royal bride. 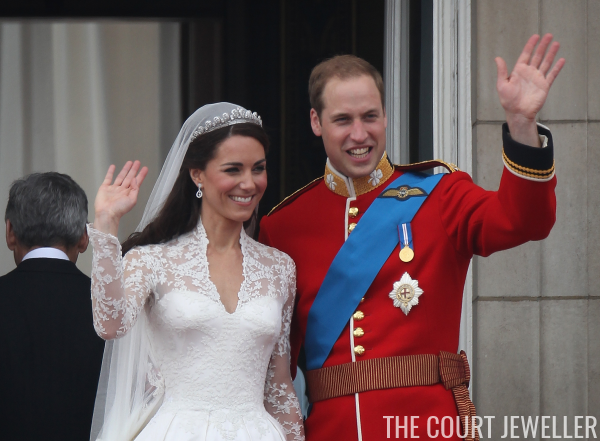 Which jewels from this royal wedding were your favorites?